I have a complicated relationship with The Today Show. Many things about it drive me nuts. For starters, Ann Curry may be a very sweet person – she can ask an evasive political candidate tough questions in such a non-confrontational way, he doesn’t know what hit him – but her hushed tones in human interest segments can be like nails on a chalkboard… especially when she sympathetically pats guests on the arm for emphasis. Some Today segments are so devoid of social or educational value, I suspect that high school interns may have temporarily hijacked the studio. A recurring favorite: Those crazy Duggars are pregnant again! Seriously? I mean the show is called “19 Kids & Counting!” When your teaser before a commercial is “The Duggars are here with a BIG announcement”, you don’t exactly need to issue a spoiler alert. This morning, however, a warm-and-fuzzy Today story helped restore my faith in humanity. At a recent Texas Rangers game, a foul ball was tossed into the stands and retrieved by a young couple, Shannon Moore and Sean Leonard. Next to them sat three-year-old Cameron Shores and his parents. Cameron already loves baseball so much, he sleeps with his glove every night, and he was NOT HAPPY for Shannon and Sean. He wanted that baseball. So Cameron threw a hissy fit. Meanwhile the giddy couple beside him was oblivious, taking iPhone photos of themselves proudly holding up the ball. Michael Kay, a Yankees announcer, aligned himself with Team Cameron right out of the gate. “Oh my God. They can’t give it to the kid? That’s awful! They’re rubbing it in the kid’s face.” If you watch the video, though, you can clearly see that Shannon and Sean didn’t have a clue. Now we reach the part of the story that impressed me so much: Cameron is a lucky boy. He has thoughtful, level-headed parents. When he lost his marbles, his parents didn’t panic. Instead, they immediately shifted him away from Shannon and Sean so that he didn’t spoil their fun, or guilt them into giving him their prize. In fact, a few minutes after the TV cameras lost interest, Shannon and Sean realized why Cameron was crying and offered him the ball – and his parents politely turned them down. I ask you, how cool are Cameron’s mom and dad?!?! I wish more parents behaved this way. Rather than assuming that the rest of us are put on this earth to revolve around their offspring, they actually thought FIRST about how his tantrum might affect OTHERS! Unbelievable! Later in the game, after Cameron had stopped crying, the Rangers organization sent out a ball for him. Of course he was thrilled, but hopefully he also learned the lesson his parents were trying to teach; You may not get what you want, whenever you want it…. but patience is often rewarded. 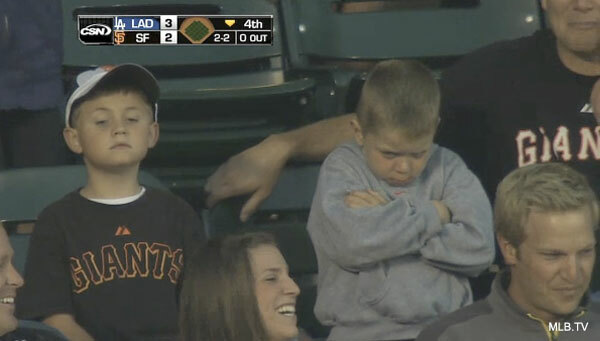 On a slightly related note, my experience at the ballpark has been it’s not just the announcers who deride adult fans who hang on to foul balls – it’s the people sitting around them. “Give it to a kid,” they shout. The kid was three years old? Older kids? Sure thing. Give them the ball, especially if its a girl, because unless she has brothers its unlikely she’ll have much opportunity to get her own. If you’re a grown-up and want a ball that bad, you can go right to the Rawlings website and buy yourself a box of ’em if thats what you want. Michael Kay? Grandstanding for a three year old kid that doesn’t know dink from doink. Three year olds, in spite of what fanciful adults might want to project on them haven’t a clue about baseball, let alone the concept of MLB other than food, hugs, lots of things to look at. Didn’t even know there was still a Today Show around. Last time I saw it, Dave Garroway was the host. Whenever a foul ball, especially a line drive, comes within 30 ft of me. I am ducking. Its a $5.00 baseball for goodness sake, I’m not bringing a glove to the park (Don’t want to get pressed into Ball-dude duty by accident ) and I’m not sticking my old arthritic mitts out there either.